Hatters midfielder Alan McCormack would love to extend his stay at Kenilworth Road beyond the end of the season, but knows that decision rests firmly with manager Nathan Jones. The 34-year-old, who joined from Championship outfit Brentford in June, is out of contract in the summer. You want to keep playing, and that’s what I want to do, so I’d love to stay here, I want to stay here, but that’s out of my hands. He had only made 15 appearances this season due to groin and calf injuries, but showed his importance by returning to the side recently, helping Luton pick up four wins and a draw to ensure promotion. On remaining with Town, McCormack said: “That’s out of my hands. “I’d love to stay here, I’ve said it all year, the way this club is going, where it’s going, I think if you walked into any club in League Two and quite a lot of League One, they wouldn’t have the ambition as what’s here. “When you’re a player at those clubs, that drives you. “It doesn’t matter the age, it drives you to better yourself, it drives you to work, drives you to do the right things and it makes you keep playing. “You want to keep playing, and that’s what I want to do, so I’d love to stay here, I want to stay here, but that’s out of my hands. 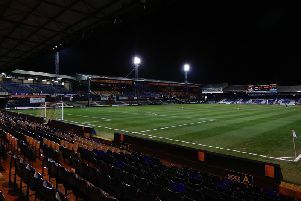 When asked if he had discussed his future with the Luton chief, McCormack continued: “No, me and the gaffer speak about playing, about bits and pieces that are going on in the game and that’s it. “We kind of know each other’s roles and it’s never like, I need to speak to the gaffer, the gaffer needs to speak to me. “He knows he can trust me and I can trust him with everything. “So if the time comes and they want to sit down and have a chat, everyone’s going to have a chat after next week, so I’ll speak to them then. Team-mate Danny Hylton would love to see McCormack remain a Hatter, as he said: “It’s not my decision, it’s the gaffer and Gary Sweet and the hierarchy, but I’m sure they’re going to make the right decisions and the right players will be brought in. “But people like Macca, they’re invaluable to this team. His experience, the type of player he is, is great.